Banning specific therapies does not stop abuse in therapy. Detailing specific harmful practices can. Over the past several years in an attempt to prevent therapeutic harm, some U.S. jurisdictions have banned sexual orientation and gender identity change efforts, sometimes labeled as “conversion therapy,” for minors. Lawmakers in other states have initiated similar efforts for both minors and adults. However, the concept of conversion therapy, as well as similar terms, has not been clearly defined. Without a precise understanding of what these laws are attempting to ban, endeavors to enforce such laws may be applied inconsistently and in a manner that may not be in clients’ best interests. As a group of mental health professionals and academics across the sociopolitical spectrum, we believe that a shared understanding of specific, potentially harmful therapeutic practices is crucial. Efforts to avoid these specific practices, we believe, will more effectively honor clients’ right to self-determination and promote their well-being than bans on loosely defined therapies. 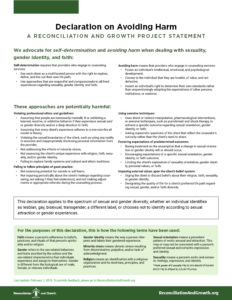 To that end, and as a complement to our more comprehensive guide, “Resolving Distress Between Faith-based Values and Sexual and Gender Diversity: A Guide for Mental Health Professionals,” this statement, “Declaration on Avoiding Harm: A Reconciliation and Growth Project Statement,” is a single-page summary and outline of practices that we believe should be avoided when providing treatment to clients of any sexual orientation, gender identity, or faith. This is the February 2019 iteration of this document. We welcome your feedback about how to further refine these concepts, which can be submitted here.